You know a recipe is a good one when it is all gone and your guests are still wiping up the smallest of scraps on their plates. Such is the case with this simple and quick recipe: Brutus Salad (which is RR code for a Caesar Salad with steak), which is from Every Day with Rachael Ray. This recipe also convinced my brother-in-law that parmie is a yummy cheese and prompted my mother-in-law to ask for the recipe. Is there any higher praise than that? I have admitted before that I am a supernerd and like to try different versions of Rachael's recipes. There is a version of this salad in the old-school 30-Minute Meals cookbook, called Beef Brutus: Sliced Steak on Caesar Greens. A similar recipe is on the food network here, but in 30 Minute Meals, it included a real egg yolk, instead of that wimpy pasteurized egg product listed. The version I made last night didn't include any egg at all. Call me crazy, but I like the raw egg in the dressing. However, I do have to admit that I didn't notice its absence in the Every Day with Rachael Ray version, so will probably end up sticking with it. Husband has really gotten into the Everything Rachael Ray blog thing, as evidenced by the fact that he took pictures of the steak after he made it. I didn't even know he did took them until I downloaded the pictures! I had to include one just to support his dedication to my cause (and because it's a darn good picture). 1. Preheat the broiler. Heat a grill pan over high heat. 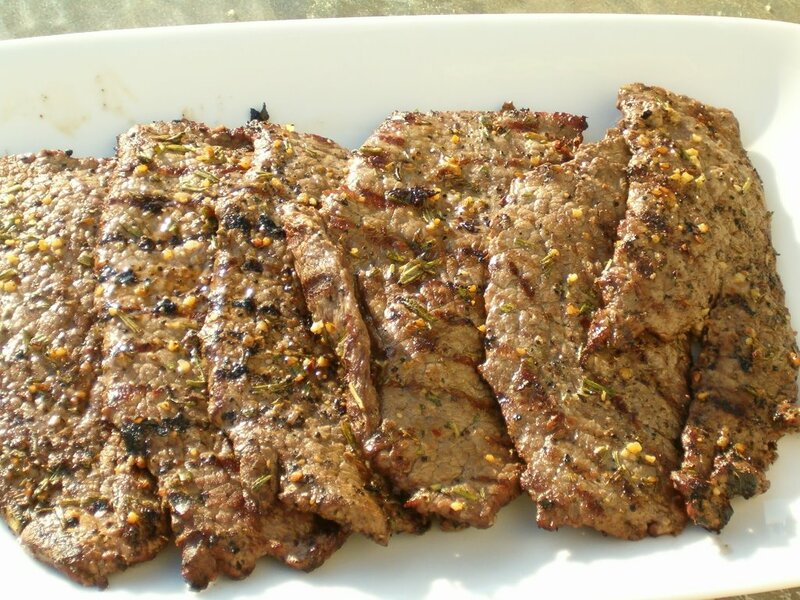 Drizzle the steak with EVOO and rub all over with the rosemary and grill seasoning. Grill the steak over high heat for 2 minutes on each side for medium-rare (these steaks are really thin). Let the meat rest to let the juices redistribute. 2. Toast the split roll or bread under the broiler until golden, then rub with 1 of the garlic cloves. Drizzle EVOO over the bread and season with a little pepper, then cut into cubes to make croutons. 3. Rub the inside of a bowl with the remaining garlic clove, then mince the garlic clove and add it to the bowl. Add the lemon juice, mustard, Worcestershire sauce, hot sauce and anchovy paste and combine with the garlic. Whisk in 1/3 cup of EVOO, then add the romaine and croutons to the bowl and toss with the dressing to coat. Add the cheese to the salad and toss again. Season to taste with pepper. Slice the meat. Serve the salad on dinner plates topped with the sliced steak. Wow that does look great!! I made this garlic chicken last night.. will update my blog later! I love going her recipes because people always love it!! It has turned me, a non-cooker into a person who doesn't mind .. actually ENJOYS cooking for others!!! Those pictures got my mouth watering! 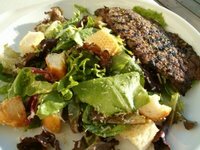 I recently made a sliced steak over salad dish from Giada recently, and it is a nice mix of hearty and light food. Depending on the locale, shell steak is another name for either a boneless CLUB STEAK or a NEW YORK STEAK. 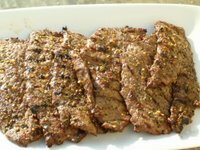 In either case a shell steak should be tender, since both the club and the New York are cut from the SHORT LOIN, the most tender section of BEEF. I've seen it mostly as a New York Strip Steak, but I live 40 miles from NY, so there might be some geographical bias there! Carrie - I look forward to reading about it. One of my favorites is her Garlic Roast Chicken with Rosemary and Lemon. If it wasn't 110 today, I would start up the oven and make it! Mike - Thanks! I own Giada's Everyday Italian, but I have serious issues branching out from RR recipes. And thanks for the shell steak 411. I think I have seen New York steak at my store, so I'll have to try that next time. Garrett - me too! With this heat, salad = happiness.